All embracing terms and conditions for a clerical assistant, typist, receptionist, personal assistant or anyone who provides administration services. The document emphasises the self employed status of the contractor. Any business who requires admin, reception or clerical assistance. In this case, it provides the essential starting point for the relationship. 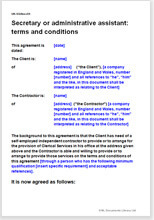 The contract emphasizes the contractors self employed status. Reduces the chances for employer obligations to arise.